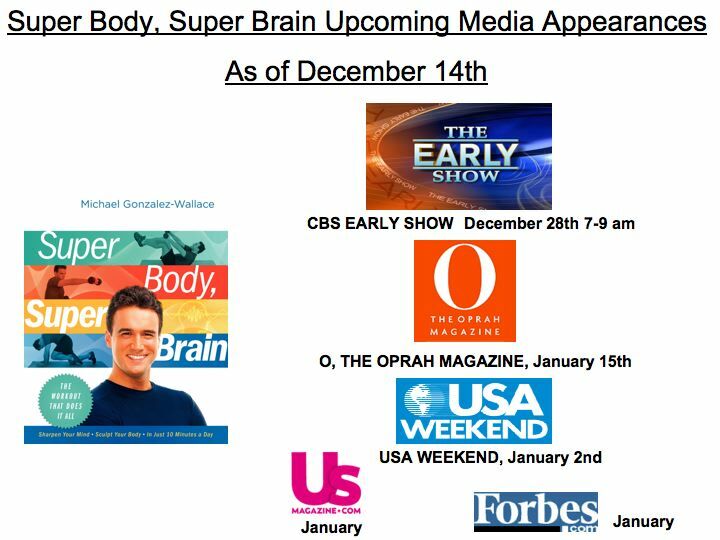 Super Body, Super Brain Upcoming Media Appearances, More coming up stay tuned! OFFICIAL ANNOUNCEMENT: I just wanted to let you know about my upcoming media appearances: As of Dec 13th: CBS EARLY SHOW-DEC 28th, USA WEEKEND (JAN 2nd), O, THE OPRAH MAGAZINE-JAN 15th, USMAGAZINE.COM, and many more to come! TOUR: All Jan dates- NYC: 5,6th, MIAMI, FL 7th, LOS ANGELES 10th, MINNEAPOLIS 11th, 12th, CHICAGO 13th. I really hope you can help me spread out the word! Thanks so much for your great support!